AUBURN, Ala. (AP) — Auburn wanted to pounce on Saint Peter’s early and did just that. Anfernee McLemore and Bryce Brown each scored 19 points to lead No. 8 Auburn to a 99-49 rout of the Peacocks on Wednesday night. The Tigers (6-1) scored the game’s first 13 points and led by as many as 32 before halftime over Saint Peter’s (1-5), which has lost five straight. 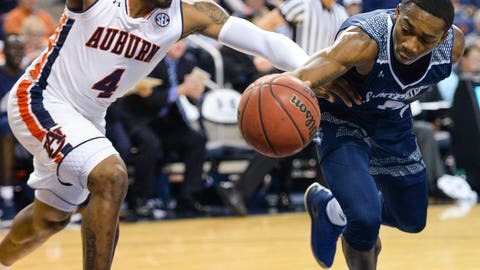 Auburn players watched film before tipoff of the first four minutes of the Peacocks’ game with North Carolina State, when Saint Peter’s held an early lead. McLemore tied a career high in points and Auburn had five players score in double figures. He hit three 3-pointers after making only two in the first six games. The 6-foot-11 Wiley attempted his first career 3-pointer. Earlier, he hit a jump shot with his foot on the line. Saint Peter’s made just 14 of 52 shots (26.9 percent) and committed 26 turnovers. “They jumped out on us early and it is hard to come back from that,” Peacocks coach Shaheen Holloway said. The Tigers just missed their third 100-point game this season in their first game since going 2-1 at the Maui Invitational. They made 15 of 31 3-pointers. Saint Peter’s: Played its fourth straight road game, including the 85-57 loss to North Carolina State. The Peacocks started 2 of 18 from the field and fell to 3-7 against Southeastern Conference teams. Auburn: The Tigers didn’t allow a field goal in the first seven minutes and led 51-23 at halftime after a one-week break from games following the Maui trip. Auburn had 25 assists, 16 steals and eight blocked shots. Jared Harper dished out eight assists and had three steals. Backup point guard J’Von McCormick tweaked an ankle during the game. Pearl switched Samir Doughty to that position and Doughty had five assists. “It was good to get him out there because we’ve got to develop a little depth at the position,” Pearl said. Saint Peter’s hosts Maine on Saturday in its first home game since Nov. 10. Auburn hosts UNC Asheville next Tuesday.